Phyllanthus amarus has been used widely in various traditional medicines to treat swelling, sores, jaundice, inflammatory diseases, kidney disorders, diabetes and viral hepatitis, while its pharmacological and biochemical mechanisms underlying its anti-inflammatory properties have not been well investigated. The present study was carried out to investigate the effects of 80% ethanolic extract of P. amarus on pro-inflammatory mediators release in nuclear factor-kappa B (NF-кB), mitogen activated protein kinase (MAPK) and phosphatidylinositol 3-kinase/Akt (PI3K-Akt) signaling activation in lipopolysaccharide (LPS)-induced U937 human macrophages. The release of prostaglandin E2 (PGE2) and pro-inflammatory cytokines, tumor necrosis factor (TNF)-α and interleukin (IL)-1β in a culture supernatant was determined by ELISA. Determination of cyclooxygenase-2 (COX-2) protein and the activation of MAPKs molecules (JNK, ERK and p38 MAPK), NF-κB and Akt in LPS-induced U937 human macrophages were investigated by immunoblot technique. The relative gene expression levels of COX-2 and pro-inflammatory cytokines were measured by using qRT-PCR. The major metabolites of P. amarus were qualitatively and quantitatively analyzed in the extract by using validated reversed-phase high performance liquid chromatography (HPLC) methods. P. amarus extract significantly inhibited the production of pro-inflammatory mediators (TNF-α, IL-1β, PGE2) and COX-2 protein expression in LPS-induced U937 human macrophages. P. amarus-pretreatment also significantly downregulated the increased mRNA transcription of pro-inflammatory markers (TNF-α, IL-1β, and COX-2) in respective LPS-induced U937 macrophages. It downregulated the phosphorylation of NF-κB (p65), IκBα, and IKKα/β and restored the degradation of IκBα, and attenuated the expression of Akt, JNK, ERK, and p38 MAPKs phosphorylation in a dose-dependent manner. P. amarus extract also downregulated the expression of upstream signaling molecules, TLR4 and MyD88, which play major role in activation of NF-κB, MAPK and PI3K-Akt signaling pathways. The quantitative amounts of lignans, phyllanthin, hypophyllahtin and niranthin, and polyphenols, gallic acid, geraniin, corilagin, and ellagic acid in the extract were determined by HPLC analysis. The study revealed that P. amarus targeted the NF-κB, MAPK and PI3K-Akt signaling pathways to exert its anti- inflammatory effects by downregulating the prospective inflammatory signaling mediators. Inflammation is an innate immune response occurring in our body to protect against harmful chemicals and invading pathogens. During inflammation, macrophages which reside in tissues and organs of human body are activated by infectious materials or injury. The activated macrophages will produce inflammatory mediators such as nitric oxide (NO), prostaglandin E2 (PGE2), interleukin 1 beta (IL-1β) and tumor necrosis factor (TNF-α), to defend against the invading pathogens [1, 2]. The occurrence of prolonged inflammatory response will lead to the development of various chronic diseases such as rheumatoid arthritis, chronic hepatitis, atherosclerosis, cancer, and inflammatory brain diseases [3–5]. Lipopolysaccharide (LPS) is a bacterial endotoxin, which activates the TLR4 receptors on macrophage and stimulates the recruitment of cytoplasmic MyD88 and TRIF adaptor proteins. The binding of the adaptor proteins on TLR4 complex will trigger the activation of nuclear factor-κB (NF-κB) and mitogen activated protein kinase (MAPK) pathways . However, NF-κB is an ubiquitous nuclear transcription factor, regulates the expression of various genes which play pivotal roles in inflammation, autoimmune diseases, apoptosis and carcinogenesis . In a resting cell, the NF-κB which consists of p50/p65 heterodimer bound to the inhibitory protein IκBs and remain inactive in cytoplasm. In response to LPS stimulation, activated IκB kinases (IKKs) will phosphorylate two specific serine residues (Ser32 and Ser36) on IκBs leading to its degradation through the ubiquitination and proteolysis by the 26S proteasome [2, 7, 8]. The resulting free NF-κB in cytoplasm will translocate into nucleus and binds to the specific IκB binding sites in the promoter region of target genes, followed by the transcription of various inflammatory mediators [1, 9, 10]. On the other hand, the MAPKs family consists of three major classes, extracellular signal-regulated kinases 1 and 2 (ERK1/2), c-Jun N-terminal kinase (JNK) and p38. The phosphorylation of the MAPKs in LPS-induced macrophages will trigger the transcriptional activation of NF-κB . Both NF-κB and MAPK pathways will work together to aggravate the inflammatory diseases in LPS-induced inflammation models [11, 12]. The uncontrolled activation of NF-κB and MAPK signaling pathways will cause detrimental effects to the living organisms. Recent studies have found that the phosphatidylinositol 3-kinase/Akt (PI3K-Akt) signaling pathway was responsible for the expression of pro-inflammatory markers through the IκB degradation and NF-κB activation in LPS induced cells. Hence, targeting these signaling pathways will be an attractive therapeutic approach for the development of anti-inflammatory drugs . Currently, non-steroidal anti-inflammatory drugs (NSAIDs) such as aspirin and ibuprofen are available to treat inflammatory diseases by inhibiting cyclooxygenase-2(COX-2) activation. However, they possess adverse effects, which include disturbance in upper gastrointestinal system and heartburn which limit their use . Therefore, many researchers are trying to find a drug with greater efficacy and minimal toxicity to treat the inflammatory related diseases . Phyllanthus amarus Schum. & Thonn. (Family: Euphorbiaceae) is a medicinal herb which is widely distributed in tropical and subtropical countries from Africa to Asia, South America and the West Indies . P. amarus has been reported to have an array of ethanopharmacological activities such as anti-inflammatory, hepatoprotective, nephroprotective, anti-amnesia, anti-cancer, diuretic, anti-oxidant, anti-viral, anti-bacterial, anti-hyperglycemic, anti-hypercholesterolemia and so on [17–19]. The plant is a rich source of secondary metabolites such as alkaloids, flavonoids, hydrolysable tannins, lignans, polyphenols, triterpenes, sterols and volatile oils [20–23]. The anti-inflammatory activities of P. amarus have been demonstrated in rat models of carrageenan-induced rat paw edema air-pouch inflammation and cotton pellet granuloma . Several lignans isolated from P. amarus such as niranthin, nirtetralin and phyltetralin exhibited in vitro and in vivo anti-inflammatory activities . Previously we have reported the in vitro inhibitory effects of P. amarus and its isolates on phagocytic activity of human neutrophils and NO production, lymphocyte proliferation and cytokine release from phagocytes [26, 27]. Immunosuppressive effects of the standardized extract of P. amarus on cellular and humoral immune responses in Balb/C mice and Wistar-Kyoto rats have also been investigated [28, 29]. Despite its various pharmacological activities, there is no comprehensive investigation on molecular mechanisms underlying the anti-inflammatory effects of P. amarus extract in human macrophages. Hence, the present study was conducted to investigate the effects of 80% ethanolic extract of P. amarus on the production of pro-inflammatory mediators and the activation of signaling molecules related to NF-κB, MAPK and PI3K-Akt signaling pathways. Roswell Park Memorial Institute (RPMI) 1640 medium, penicillin-streptomycin (Pen Strep), fetal bovine serum (FBS) were purchased from Gibco (Grand Island, NY, USA). Phorbol 12-myristate 13-acetate (PMA), LPS (Escherichia coli 055:B5), RIPA buffer, DMSO were purchased from Sigma Chemical Co. (St. Louis, MO, USA). 1× Halt Protease and Phosphatase Inhibitor Cocktail was purchased from Pierce (Rockford, IL, USA). Human TNF-α and IL-1β enzyme-linked immunosorbent assay (ELISA) kits were purchased from R&D Systems (Minneapolis, MN, USA). Alamar blue reagent for cell viability assay was purchased from Life Technologies (Grand Island, NY, USA). Primary antibodies specific to COX-2, p-p38, p38, p-ERK1/2, ERK1/2, p-JNK1/2, JNK1/2, p-IκBᾳ, IκBᾳ, p-IKKᾳ/β, p-NFκBp65 and β-actin were purchased from Cell Signaling Technology (Beverly, MA) and, in addition, anti-rabbit secondary antibody conjugated to horseradish peroxidase was obtained from Cell Signaling Technology (Beverly, MA). Methanol and acetonitrile of HPLC grade were purchased from Fisher Scientific (Loughborough, UK). Phyllanthin, hypophyllanthin, niranthin gallic acid, ellagic acid, corilagin and geraniin (purity > 98%) were purchased from ChromaDex (CA, USA). Dexamethasone was obtained from CCM Duopharma Biotech Bhd (Selangor, Malaysia). The whole plants of P. amarus were collected from Marang, Kuala Terengganu, Malaysia, in February 2015. The plant was authenticated by Dr. Abdul Latif Mohamad of Faculty of Science and Technology, Universiti Kebangsaan Malaysia (UKM). A voucher specimen (voucher number UKMB 30075) has been deposited at the Herbarium of UKM, Bangi, Malaysia for future reference. The plant materials were dried at room temperature and powdered. The powdered plant material was macerated with 80% ethanol for 72 h and the crude ethanol extract was filtered through Whatmann No 1 filter paper. The filtrate was solvent-evaporated using rotary evaporator, freeze dried and stored in an airtight container for further investigation. Qualitative and quantitative high performance liquid chromatography (HPLC) analysis of the 80% ethanolic extract of P. amarus was carried out according to the method of Jantan et al. with slight modification . These stock solutions (20 mg/mL) were sonicated for 15 min and filtered through 0.45 μm Millipore Millex PTFE membranes (Maidstone, Kent, UK). The solutions for reference standards (phyllanthin, hypophyllanthin, niranthin, gallic acid, ellagic acid, corilagin and geraniin) were prepared at a concentration of 1 mg/mL and further diluted into a series of concentration (1000–125 μg/mL). The HPLC analysis was performed on a Waters 2535 Quaternary Gradient Module equipped with PDA Photodiode Array Detector (Waters 2998) of wavelength ranging from 205 to 270 nm and data were acquired by using Empower 3 software. The chromatographic analysis was performed on an XBridge™ C-18 (250 mm length × 4.6 mm i.d., 5 μm) analytical column (Waters, Milford, MA, USA). Analysis of the extracts and standard solutions of lignans (phyllanthin, hypophyllanthin, niranthin) followed the following parameter: isocratic elution with solvent A. acetonitrile: solvent B. water (acidified with 0.1% orthophosphoric acid) (55:45) as mobile phase at a flow rate of 1.0 mL/min. The column was maintained at 25 °C and the detection wavelength was 205 nM. The identification and quantification of the polyphenols (geraniin, corilagin, ellagic acid and gallic acid) in the 80% ethanolic extract of P. amarus were carried out based on the chromatographic condition as follows: gradient elution with acetonitrile and 0.2% orthophosphoric acid as mobile phase at a flow rate of 1.0 mL/min. Quantification of compounds in the extracts was based on the standard curves equations obtained by plotting calibration curves of five concentrations (1000–125 μg/mL) each of the standard solution of compounds versus the areas under the peaks. The HPLC method was validated by determining the linearity, precision, limits of quantification (LOQ) and detection (LOD). The precision of the method was determined by studying intra-day and inter-day variations. Separately one concentration of extracts (20 mg/mL) and reference compounds (125, 500, 1000 μg/mL) were injected three times for each concentration in one day and on three different days. The calibration curve was obtained by using phyllanthin, hypophyllanthin and niranthin as external standards. Six concentrations of each standard (31.25–1000 μg/mL) were injected in triplicate, and the curve was constructed by plotting the corresponding peak areas versus the concentration of each standard. The linearity was evaluated by linear calibration analysis while the correlation coefficient (R2) was calculated from the calibration curves. LOD and LOQ were calculated from RSD and slope (S) of the calibration curves by using following equations: LOD =3.3 × (RSD/S) and LOQ =10 × (RSD/S). LC-MS analysis was performed onThermo Scientific C18 column (AcclaimTM Polar Advantage II, 3 × 150 mm, 3 μm particle size) on an UltiMate 3000 UHPLC system (Dionex). The LC-MS was carried out by using the gradient program at 0.4 mL/min, 40 °C using H2O + 0.1% Formic Acid (A) and 100% ACN (B) with 22 min total run time with sample injection volume of 1 uL. Gradient started at 5% B (0-3 min); 80% B (3-10 min); 80% B (10-15 min) and 5% B (15–22 min). The positive and negative ionization spectra obtained with MicroTOF QIII Bruker Daltonic with the following settings:- capillary voltage: 4500 V; nebulizer pressure: 1.2 bar; drying gas: 8 L/min at 200 °C. The mass range was at 50–1000 m/z. The accurate mass data of the molecular ions, provided by the TOF analyzer, were processed by Compass Data Analysis software (Bruker Daltonik GmbH). The corresponding peaks of the compounds were identified by comparison with the mass spectral library. U937 (ATCC ® CRL-1593.2) cell line was obtained from ATCC (American Type Culture Collection). U937 mononuclear cell line was grown in RPMI 1640 medium supplemented with 10% (v/v) fetal bovine serum (FBS) and 1% (v/v) penicillin G/streptomycin at 37 °C under 5% CO2. The U937 cells density was maintained between 1 X 105 and 2 X 106 viable cells/mL throughout the experiments. Cells were harvested once the cell confluency reached approximately 80–90%. For all the experiments, the U937 cells were differentiated to obtain macrophage like phenotype by addition of phorbol 12-myristate 13-acetate (PMA) (Sigma-Aldrich) at 200 nM, for 24 h. The following day, cells were washed with complete culture media once and incubated overnight with serum free media for recovery phase [1, 30]. The cell viability assay was carried out with Alamar blue reagent according to the manufacturer standard protocol to determine the cytotoxicity effect induced by the 80% ethanolic extract of P. amarus. The differentiated macrophages were plated at a density 5 × 105 cells/mL onto 96 well plate. P. amarus extract was dissolved in DMSO, and the DMSO concentration did not exceed 1%. The cells were treated with various concentrations of P. amarus extract of serial dilutions 60, 30, 15, 7.5, and 3.25 μg/mL and then incubated for 24 h. After 24 h of incubation, 10% v/v of 10 x Alamar blue cell viability reagents was added into each well followed by 4 h incubation at 37 °C, 5% CO2 incubator. Then the reduction of an active compound of Alamar blue, resazurin into resorufin by viable cells was read with Tecan plate reader at 570 nm using 600 nm (normalized to 600 nm value) as a reference wavelength. The results were expressed as percentage of viable cells over control cells . To investigate the effect of P. amarus extract on cytokines levels from LPS-induced cells, differentiated U937 macrophages (5 × 105 cells/mL) seeded into 24 well plate were pretreated with 60, 30,15,7.5 and 3.75 μg/mL of P. amarus extract or with 4, 0.4, 0.04, 0.004 and 0.0004 μg/mL of dexamethasone for 2 h prior to 24 h stimulation with 1 μg/mL LPS. In another experiment, the differentiated cells also pretreated with SB202190 (a p38 inhibitor, 10 μM), U0126 (an ERK inhibitor, 10 μM), SP600125 (a JNK inhibitor, 10 μM), BAY 11–7082 (an NF-κB inhibitor, 10 μM) and LY294002 (an Akt inhibitor, 10 μM) for 2 h and then cultured with LPS of 1 μg/mL for 24 h to study the effect of inhibitors on TNF-α release. The U937 macrophages untreated with LPS which acted as a control was included for comparison. After 24 h, the cell free supernatants were collected and stored at − 20 °C until cytokine analysis. The concentrations of TNF- α and IL-1β in the supernatants of U937 cell cultures were determined using DuoSet® ELISA Development System (R&D Systems, Minneapolis, MN, USA) kit according to the manufacturer protocol [1, 19]. The differentiated U937 cells were plated in a 24 well plate and pretreated with concentrations of P. amarus (60, 30 and 15 μg/mL) for 2 h and then stimulated with 1 μg/mL of LPS for 24 h. The supernatants were assayed to determine the PGE2 level. The PGE2 level was analyzed by using ELISA kit (R&D Systems, Minneapolis, MN, USA) according to manufactures protocol [1, 19]. U937 macrophages (1 × 106 cells/mL) were pre-treated with varying concentrations of P. amarus (60, 30, and 15 μg/mL) for 2 h and later cultured with LPS of 1 μg/mL for 1 day. The inhibitory properties of P. amarus on the expression of COX-2, TNF-α, and IL-1β were evaluated by qRT-PCR [1, 19]. To determine the gene expression level, total RNA was extracted from LPS treated U937 cells by using innuPREP RNAmini kit (Analytik Jena AG, Germany) and cDNA was synthesized by using SensiFAST™ cDNA Synthesis Kit (Bioline USA Inc., Taunton, MA) following manufacturer protocol. Quantification of mRNA by qRT-PCR was done using CFX96 Touch™ Real-Time PCR Detection System (Biorad, Hercules, California, USA) along with SYBR® Green RT-PCR Master Mix (Bioline USA Inc., Taunton, MA). The cDNA was amplified by using the following primers; COX-2 (Hs_PTGS2_1_SG QuantiTect Primer QT00040586), TNF-α (Hs_TNF_3_SG QuantiTect Primer QT01079561), IL-1β (Hs_IL1B_1_SG QuantiTect Primer QT00021385) and GADPH (Hs_GAPDH_1_SG QuantiTect Primer QT00079247). The PCR reaction mixture consisted of 10 μL of SYBR master mixture, 2 μL of reverse and forward primers, 6 μL of deionized water and 2 μL of cDNA. The reaction was carried out in the following parameter: 95 °C for 2 s, 95 °C for 5 min, 60 °C for 10 min, 72 °C for 20 min (36 cycles). The relative fold difference between samples was determined following the comparative cycle threshold (2-∆∆Ct) method. Glyceraldehyde 3-phosphate dehydrogenase (GADPH) was used as the housekeeping gene for normalizing the data. Differentiated cells (1 × 106 cells/mL) were plated onto six well plate and pretreated with 60, 30, 15 μg/mL of P. amarus extract, SB202190, U0126, SP600125, LY294002 and BAY 11–7082 (10 μM) for 2 h and then stimulated with 1 μg/mL of LPS for 30 min. The cells were harvested by centrifugation at 7000 x g for 5 min and washed twice with ice cold PBS. The washed cell pellets were lysed in RIPA buffer and halt protease and phosphatase inhibitor cocktails. The cell lysates were centrifuged at 13,000 x g for 10 min and protein concentrations were measured by Bradford assay. Approximately 20 μg of proteins were resolved by 10% SDS-polyacrylamide gel electrophoresis and were electroblotted onto polyvinylidene difluoride (PVDF) membrane. The immunoblot was incubated for 1 h with 5% skim milk powder in TBS-T buffer containing 0.1% Tween 20 to block the nonspecific binding prior to the overnight incubation with specific primary antibodies that recognized COX-2, p-p38 (Thr180/Tyr182), p38, p-ERK1/2 (Thr202/Tyr204), ERK1/2, p-JNK1/2 (Thr183/Tyr185), JNK1/2, p-IκBα (Ser32/36), IκBα, p-IKKα/β (Ser176/180), p-NFκBp65 (Ser536), p-Akt (Ser 473) and β-actin (Cell Signaling Technology Inc., Beverly, MA). The following day, membrane was washed with TBS-T (0.1% Tween 20) 3 times for 10 min each. It was then incubated with anti-rabbit secondary antibody conjugated to horseradish peroxidase for 1 h at room temperature with agitation and washed 3 times with TBST for 10 min each. Each protein band was detected using chemiluminescence detection system according to the manufacturer instruction. The band intensity was quantified using Image Lab™ software [1, 2, 31]. Statistical analyses were performed using the GraphPad Prism 6.0 (GraphPad Software, San Diego, CA, USA). For each experiment, three independent experiments were performed and data are expressed as mean ± standard error mean (SEM). Differences between two means were analyzed by one-way analysis of variance (ANOVA) followed by post-hoc Dunnett’s test with P < 0.05 considered as statistically significant. To identify and quantify the active components of P. amarus we performed HPLC analysis of the ethanol extract and several representative standards as previously reported by Jantan et al. . Peaks with the same retention time as the standard compounds, phyllanthin (11.17 min), hypophyllahtin (11.71 min) and niranthin (14.48 min) were observed in P. amarus (Fig. 1a). For the polyphenols, four peaks were identified namely gallic acid (7.89 min), geraniin (23.76 min), corilagin (26.41 min) and ellagic acid (33.42 min) (Fig. 1b). Among the lignans, phyllanthin (660.28 μg/mL) was present at the highest concentration compared to niranthin (575.11 μg/mL) and hypophyllanthin (290.46 μg/mL). Among the identified polyphenols, ellagic acid (601.29 μg/mL) was the most abundant, followed by corilagin (313.41 μg/mL), geraniin (170.49 μg/mL) and gallic acid (163.30 μg/mL). The LC-MS results revealed that P. amarus extract consisted of 18 compounds identified via positive ionization mode while five compounds identified via negative ionization mode (Table 1). U937 macrophages were incubated with the 80% ethanolic extract of P. amarus ranging from 0 to 60 μg/mL and cell viability was determined by alamar blue assay after 24 h. The results demonstrated that from 0 to 60 μg/mL of P. amarus extract, there was no cytotoxic effect on U937 macrophages (cell viability greater than 90%). These results confirmed that the effects of P. amarus on U937 macrophages in this study were not due to cytotoxicity. To investigate the anti-inflammatory effects of P. amarus extract on LPS-stimulated macrophages, firstly the concentrations of TNF-α and IL-1β in the culture supernatants of U937 macrophages were determined by ELISA kit. The results demonstrated that, the pro- inflammatory cytokines (TNF-α and IL-1β) production was significantly upregulated in LPS induced U937 macrophages while the cells pretreated with P. amarus for 2 h prior to LPS stimulation showed suppressive effect on TNF-α and IL-1β production with IC50 values of 16.12 and 7.13 μg/mL, respectively (Fig. 2a and b). In addition, the suppressive effect also was observed for sample treated with an standard anti-inflammatory agent, dexamethasone which exhibited inhibitory activity on TNF-α and IL-1β with IC50 values of 0.18 μg/mL and 0.002 μg/mL, respectively. Next, we determined the effects of P. amarus on pro-inflammatory cytokines expression at pre-translational level by using quantitative Real-Time RT-PCR (qRT-PCR). As shown in Additional file 1: Figure S1, the mRNA expression of TNF-α and IL-1β were significantly (P < 0.001) upregulated in U937 macrophages 24 h following LPS stimulation. However, the cells pretreated with P. amarus (60, 30 and 15 μg/mL) for 2 h showed a significant inhibition in LPS induced TNF-α (27, 32, and 35 fold, respectively) and IL-1β (12, 32, and 35 fold, respectively) (Fig. 2c and d). These gene expression levels also were comparable with 4 μg/mL dose of dexamethasone pretreated cells prior to LPS induction. Dexamethasone pretreated cells also showed an inhibition of TNF-α and IL-1β expression (8 and 2 fold respectively) (Fig. 2c and d). The consistent inhibition of cytokine expression at protein and mRNA levels suggests that P. amarus may exert their anti-inflammatory effects by controlling gene transcription. To examine the effect of P. amarus on PGE2 release, production of PGE2 in culture supernatant was measured. PGE2 production was measured in U937 macrophages induced with LPS for 24 h in the presence and absence of P. amarus. As shown in Fig. 3a, LPS (1 μg/mL) induced U937 macrophages produced significant amount of PGE2 (1128.67 ± 200.07 pg/mL) compared to control (31.33 ± 11.31 pg/mL). However, the production of PGE2 was significantly attenuated by P. amarus pretreatment at 60, 30 and 15 μg/mL in a dose- dependent manner. In order to examine the mechanisms by which P. amarus inhibited LPS- induced PGE2 release, the expression of COX-2 at protein and gene level was measured in U937 macrophages induced with LPS. As shown in Fig. 3b, Western blot analysis showed that 24 h LPS stimulation significantly (P < 0.001) upregulated the COX-2 protein expression while 2 h P. amarus (60, 30 and 15 μg/mL) pretreatment significantly attenuated the expression in a dose-dependent manner. In addition, we have investigated the effects of P. amarus on gene expression to determine whether P. amarus inhibited the LPS induced COX-2 mRNA level in U937 macrophages. As shown in Fig. 3c, the significantly (P < 0.001) increased COX-2 mRNA expression (282 fold) in LPS stimulated cells were significantly attenuated in P. amarus (60 and 30 μg/mL) pretreated cells (137 and 259 fold, respectively) as compared to control. To determine the role of IKK/IκB/NF-κB signaling pathway in P. amarus mediated inhibition of LPS-induced inflammatory response, we studied the activation of p-NF-κB (p65), NF-κB (p65), p-IκBα, IκBα, p-IKKα/β, and IKKα/β in LPS-induced human macrophages by Western blot. Our results demonstrated that, P. amarus altered the NF-κB signaling mechanisms by suppressing the phosphorylation of IKKα/β and IκBα in a dose-dependent manner, which were significantly (P < 0.001) upregulated by 30 min LPS treatment. In addition, the 2 h P. amarus pretreatment significantly blocked the degradation of LPS induced IκBα in a concentration-dependent manner (Additional file 2: Figure S2). Furthermore, the 2 h pretreatment with P. amarus also significantly attenuated the LPS-induced phospho-p65 without altering the total level of p65 in human U937 macrophages (Fig. 4). Studies have demonstrated that the activation of Akt and MAPKs (JNK1/2, ERK1/2, and p38) signaling molecules is important to initiate and mediate the NF-κB signal transduction pathway. Hence,we investigated the effect of P. amarus on phosphorylation of Akt by Western blot analysis. As depicted in Fig. 5, the 30 min LPS induction significantly upregulated Akt phosphorylation while 2 h P. amarus pretreatment dose-dependently suppressed the phosphorylation. 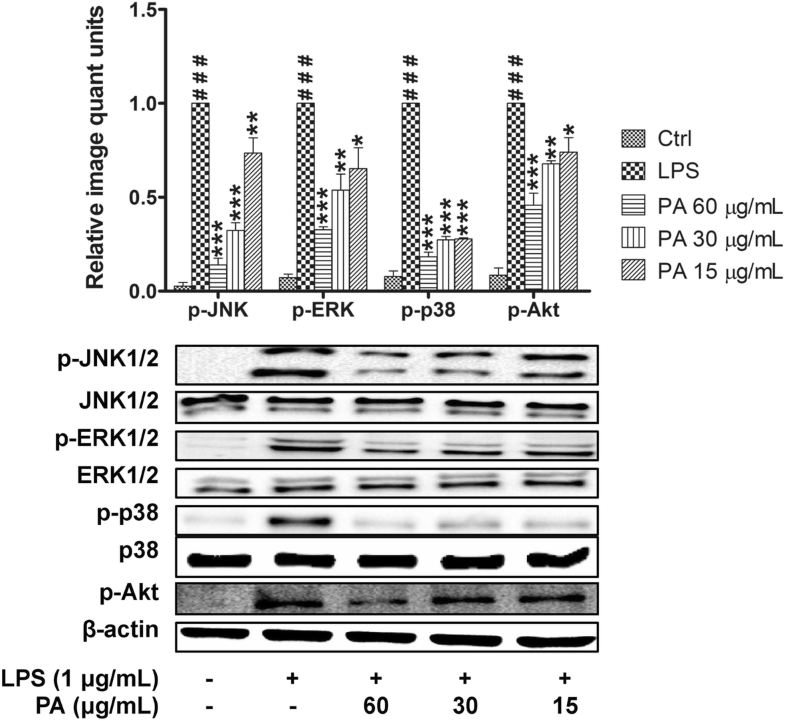 Furthermore, the effect of PA on phosphorylation activity of three important MAPKs signaling molecules (JNK1/2, ERK1/2, and p38) was also investigated. The LPS induction at 30 min significantly (P < 0.001) stimulated the JNK1/2, ERK1/2, and p38 phosphorylation levels in macrophages but the cells pretreated with P. amarus (60, 30 and 15 μg/ml) for 2 h significantly suppressed the phosphorylation of JNK1/2, ERK1/2, and p38 protein kinases in a dose-dependent manner without interfering the total level of JNK1/2, ERK1/2, and p38 protein kinases (Fig. 5). In order to further validate that the suppression of inflammatory mediators by P. amarus linked to the NF-κB, MAPKs, and Akt signaling pathway down regulation, we examined the effect of specific NF-κB, MAPKs, and Akt inhibitors on TNF-α production and COX-2 protein expression. The 2 h pretreatment of LPS-induced macrophages with BAY 11–7082 (an NF-κB inhibitor), LY294002 (an Akt inhibitor), SB202190 (a p38 inhibitor), U0126 (an ERK inhibitor) and SP600125 (a JNK inhibitor) showed significant inhibitory effect on TNF-α production and COX-2 expression (Fig. 6). Taken together, our results suggest that P. amarus reduced COX-2 expression and TNF-α production by down regulating LPS-activated NF-κB, ERK, JNK, p38MAPKs and Akt signaling pathways. To further confirm the anti- inflammatory activity of P. amarus, the expression of MyD88 and TLR4 were investigated in LPS-induced U937 macrophages. As shown in Fig. 7, 1 h LPS induction significantly (P < 0.001) upregulated the expression of MyD88 and TLR4 compared to control cells. However, the cells pretreated with P. amarus for 2 h dose- dependently diminished the upregulation of MyD88 and TLR4 protein expression. It was noted that, at the dose of 60 μg/mL, the suppression of P. amarus was found highly significant (P < 0.001) for the both upstream signaling molecules. P. amarus is a promising herbal resource with therapeutic potential against various diseases due to the presence of numerous active and secondary metabolites . Although P. amarus extracts have been previously shown to possess immunosuppressive activity on immune cells but the mechanism underlying the anti-inflammatory activity of the plant remain unknown [27, 32–34]. Therefore, in the present study we investigated the in vitro effects of P. amarus by using LPS-activated U937 human macrophage, which mimics the inflammatory model . Macrophages can be activated by LPS to produce pro-inflammatory molecules such as IL-6, TNF-α, IL-1β, PGE2 and NO by triggering intracellular signaling pathways including NF-κB and MAPKs [1, 2, 35]. COX is known as an enzyme which aid in the process converting the arachidonic acid to prostaglandins and it exists as COX-1 and COX-2 isomers. COX-1 is responsible for the homeostatic function of PGE2 while COX-2 triggers the excess release of PGE2 at the region of inflammation which is known to play critical role during pathogenesis of chronic diseases [31, 36, 37]. 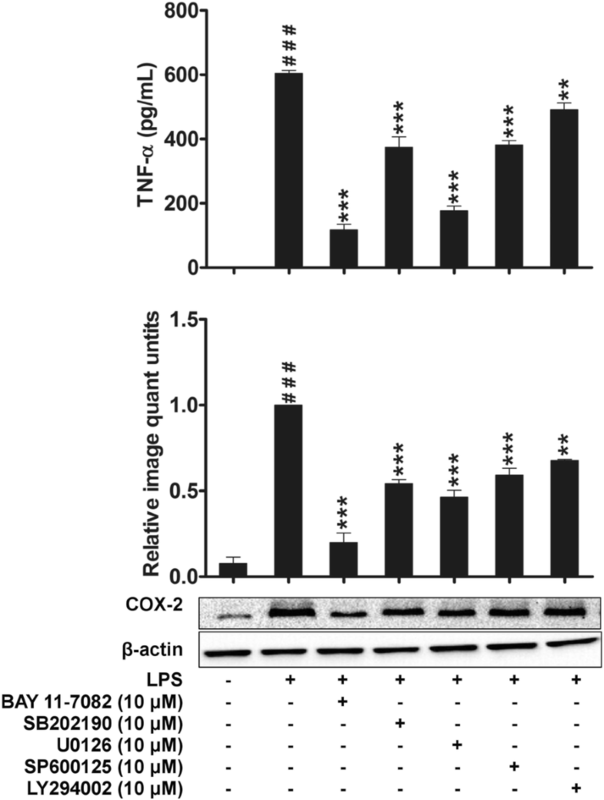 Besides, it is also reported that overexpression of COX-2 leads to the upregulation of several angiogenic mediators . Therefore, potent inhibitory effects of anti-inflammatory drugs on COX-2 expression have been revealed by several researches to be valuable in preventing and curing these disorders . In current study, we found that P. amarus extract suppressed the PGE2 production in LPS stimulated U937 macrophages by down regulating the COX-2 protein and gene expression. These finding suggest that the suppression of PGE2 release by P. amarus extract might be due to the inhibition of COX-2 elevation upon the LPS induction of macrophages. Furthermore, Kiemer et al. also reported the inhibitory effect of P. amarus extract on PGE2 production in rat Kupffer cells and RAW264.7 macrophages, whick were in consistent with our present finding. Like COX-2, iNOS is also one of the enzyme that is involved in the production of excess NO during chronic inflammatory disorders to alleviate the pathogenesis of disease state . It is to be noted that from our experiment NO could not be detected at measurable quantity in the LPS induced U937 macrophages which is in agreement with the previous report . The probable reason for this occurrence may linked to the statement that, U937 cells lack of BH4 (tetrahydrobiopterin) which is the crucial cofactor for NO production [19, 41]. TNF-α and IL-1β are known as a key pro-inflammatory cytokines that are secreted during the development of chronic inflammatory diseases . 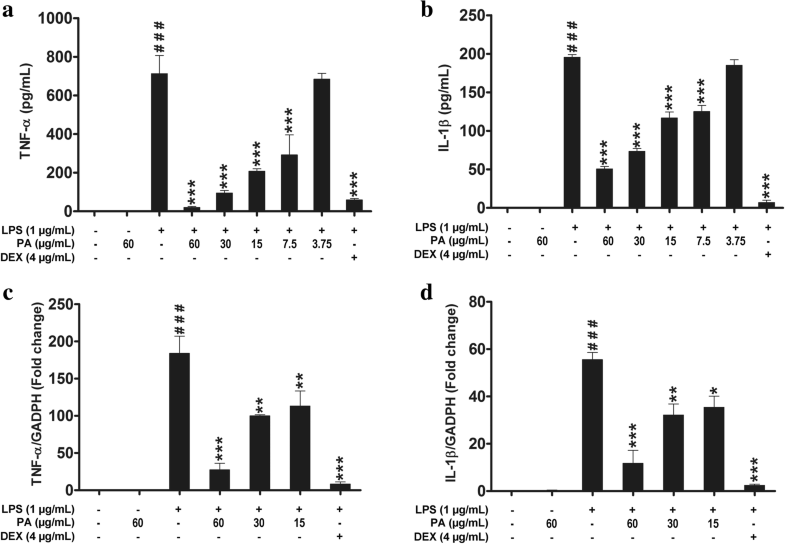 In this study we found that the extract of P. amarus and positive control, dexamethasone showed a significant inhibition of pro-inflammatory cytokines in a concentration-dependent manner in LPS-stimulated human macrophages. The outcome was found in line with the previous study where the inhibitory effect of P. amarus on pro-inflammatory cytokines such as TNF-α, IL-1β and IFN-γ in LPS induced immune cells has also been observed . NF-κB signaling plays a major role in macrophages to regulate the cell survival genes and induces transcription and translation of other mediators that are involved in inflammatory response . Thus, the inhibition of these signaling pathways may highlight the potential of P. amarus as a suppressor of inflammatory cytokines. Consistent with previous report, P. amarus ethanolic extract inhibited the production of LPS-induced TNF-α and IL-1β that are known to regulate by NF-κB signaling pathway. Interestingly, our present findings revealed that P. amarus extracts dose –dependently diminished the phosphorylation of IKKα/β and IκBα in response to LPS. Furthermore, LPS-induced IκBα degradation in U937 cells also inhibited by P. amarus in a dose dependent manner. 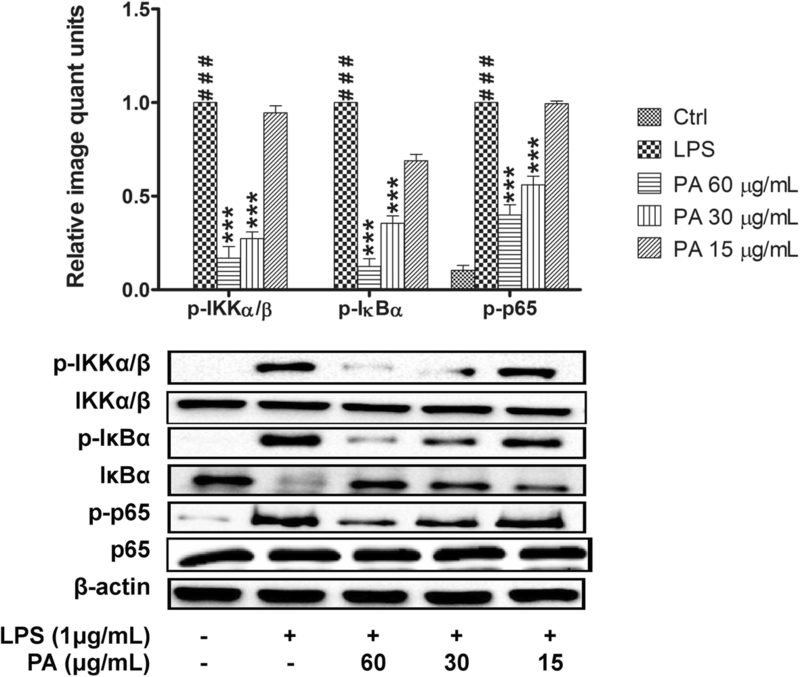 These findings indicate that the downregulation of LPS-induced inflammatory cytokines production by P. amarus results from the blockade of IKK/IκB/NF-κB signaling pathway. A study has reported that P. amarus inhibited the DNA binding activity of NF-κB binding factors and also iNOS and COX-2 expression in LPS-induced murine macrophages . This is in agreement with our findings which showed that P. amarus was able to downregulate the NF-κB activation by suppressing the release of pro- inflammatory mediators. Apart from NF-κB, LPS-induced macrophages also activate MAPKs signaling pathway, which regulate the expression of inflammatory mediators by controlling NF-κB activity . Our study demonstrated that pretreatment of cell with P. amarus inhibited the early activation of cell by LPS in a dose-dependent manner. Thus, our study strongly indicates that the MAPKs (JNK, ERK, and p38) were involved in inhibitory activity of P. amarus on the expression of pro-inflammatory mediators. Apart from NF-κB and MAPKs, phosphatidylinositol 3-kinase/Akt (PI3K-Akt) is another signaling pathway which is activated in LPS induced macrophages to control the expression of inflammatory markers by activating the NF-κB signal transduction pathway . Hence, blocking the phosphorylation activity of Akt in response to LPS induction is known to be an important target to control inflammatory disorders. Supportingly, our study revealed that, P. amarus pretreatment significantly attenuated the LPS induced Akt phosphorylation in LPS induced human macrophages. Furthermore, in this study we proved that the suppression of TNF-α production and COX-2 protein expression by P. amarus were due to the blockage of NF-κB, MAPKs, and Akt pathways through the use of NF-κB, MAPKs, and Akt inhibitors. TLR4 is known to specifically bind with LPS and trigger inflammatory response by activating NF-κB, MAPKs, and PI3K-Akt signaling pathways which lead to the production of inflammatory mediators [1, 46, 47]. The activated TLR4 sequentially transmit the inflammatory signals through the adaptor protein, Myd88 . 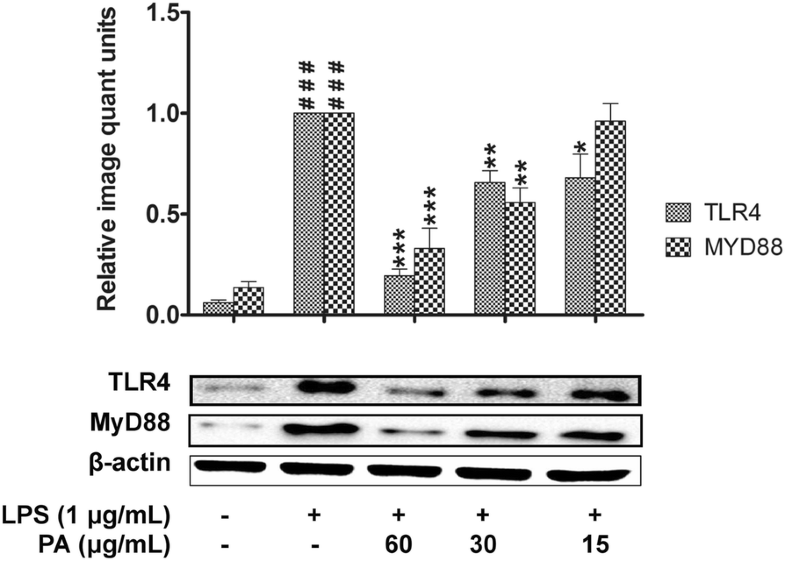 This suggests that, TLR4 and MyD88 act as a specific molecular target to inititate inflammatory responses [47, 49]. Our investigation demonstrates that P. amarus significantly inhibited LPS-induced TLR4 and MyD88 expression in U937 macrophages. These findings propose that TLR4 and MyD88 participated in the inhibitory action of P. amarus on the LPS-induced production of PGE2 and pro-inflammatory cytokines. In conclusion, the present study demonstrated that P. amarus potently suppressed the inflammatory responses in LPS-induced U937 macrophages via inhibition of MyD88-dependent signaling pathway, which may be linked to the inhibitory effects exerted by P. amarus on pro-inflammatory mediators. Therefore, the ethanol extract of P. amarus have promising anti-inflammatory activity which acts through the suppression of NF-κB, MAPKs, and PI3K-Akt signaling pathways and may have beneficial therapeutic applications for treating inflammatory disorders. This work was supported by the Ministry of Agriculture and Agro-based Industry, Malaysia, under the NKEA Research Grant Scheme (NRGS) (Grant no. NH1014D020). This study was funded by the Ministry of Agriculture Malaysia under the NKEA Research Grant Scheme (NRGS) (no. NH0811D003). HK carried out the experiments, analyzed and interpreted the data, and drafted the manuscript. IJ and EK designed the study and participated in analysis and interpretation of data. IJ coordinated the study, revised the manuscript and approved the final version to be submitted for publication. MAH helped in the analysis and interpretation of data. All authors read and approved the final manuscript. Haque MA, Jantan I, Harikrishnan H, Abdul Wahab SM. Magnoflorine enhances LPS-activated pro-inflammatory responses via MyD88-dependent pathways in U937 macrophages. Planta Med. 2018; https://doi.org/10.1055/a-0637-9936.